Bubba never mentioned shrimp tempura—and boy, was he missing out. 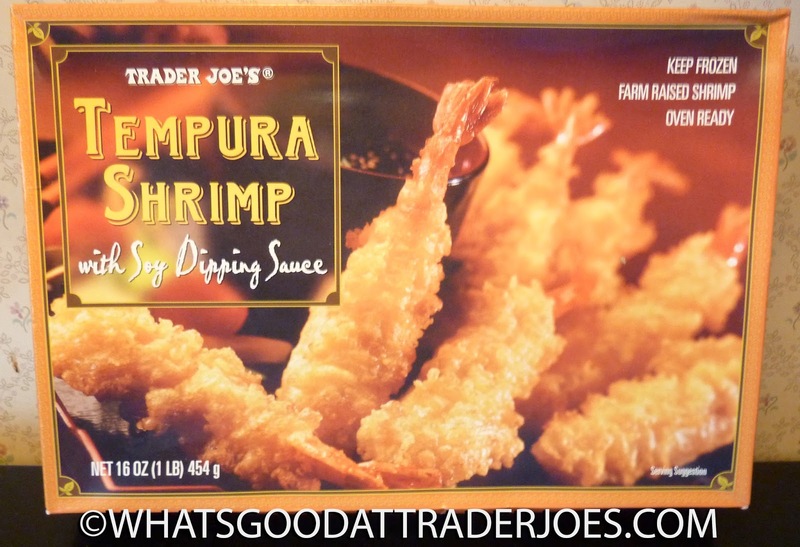 I've always loved shrimp, fried, steamed, or otherwise, and I've always loved tempura anything. So there are plenty of things stacked in favor of this product right off the bat. There's also one big thing I have against it, even before tasting it: the price. At $7.99, this product ranks right up there with the most expensive things we've ever bought from Trader Joe's. I'm not saying it's not a good value. I'm just saying that it takes a lot to get that much money out of me for a single product at the grocery store. In other words, I'm cheap. When compared to a restaurant, of course, the price is more than reasonable—and these shrimp are most definitely restaurant-quality. They're huge, farm-raised, and tasty as can be—not fishy in the slightest. We baked ours in the oven, followed the directions pretty closely, and they came out just about perfect. The tempura is good, too, although, I'd say it's a bit thicker here than most tempura products I've tried. 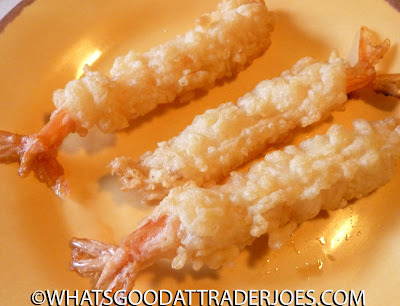 I've only ever had tempura as a very thin, crispy outer layer. 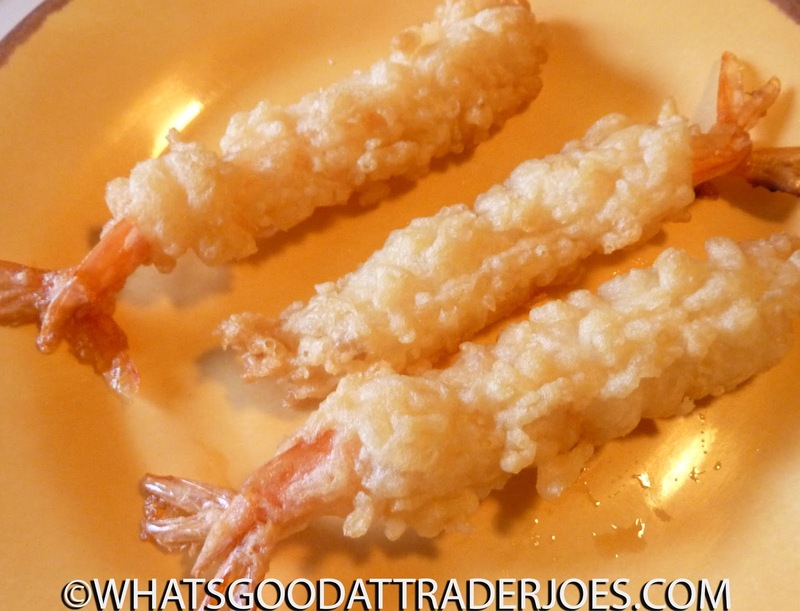 In this case, the tempura is crisp on the outside, but there's enough of it that there's almost a doughy layer in between the crispness and the shrimp. It's not so thick or soft that it's off-putting in any way. It's just not quite what I'm used to. The sauce is simply a sweet soy sauce—basically what you'd get if you dumped a bunch of sugar into those ubiquitous packets from Asian restaurants. And there's TONS of it. I'm generally a gluttonous condiment hog, and there have been dozens of TJ's products throughout the years that were super-skimpy on dipping sauces. Not here. There are two large packets where just one would most likely have sufficed. If I had it to do over, I would have only opened the first one and saved the other for leftover rice and veggie dumplings from our next Asian take-out run. Oh well. Live and learn, as they say. There are ten shrimp in the pack. Three work well as a single serving. They're quite filling and satisfying, and definitely not wanting as far as quality is concerned. The price tag alone will prevent this from being a regular purchase in our home, but if I ever get a particular craving for shrimp, I have a feeling this product will quickly come to mind. Sonia enjoyed them, too, but I don't think she's quite as big a shrimp-o-phile as her hubby. Three and a half stars from her. Four from me. I was thinking the same thing....to make a crunchy roll then top with avocado. Perfect! For being fried in batter, I'm kind of surprised at the nutritional facts - not too shabby! Considering at a restaurant or take away you would pay probably $8 for 3-4pcs (with shrimp of questionable origins) this does sound like a worthy alternative.